TBT History: Lost in Round 1 in 2014. Lost in Round 2 in 2015. Lost in Round 1 in 2016. Lost in Round 1 in 2017. 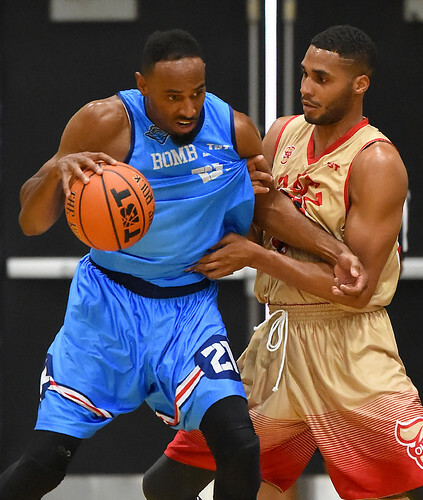 The Air Force Bomb Squad are one of just four teams left in the field from TBT’s inaugural season back in 2014, and they’re hoping that the fifth time’s a charm. Their best finish came back in 2015 when they made it into the second round, but in the other years, they were unable to make it into the Round of 32. But the fact that the Bomb Squad is able to come out and compete with the best teams TBT has to offer is a testament to their commitment to the game. The Bomb Squad is composed mostly of active Air Force service members who played for the Falcons during their college days. 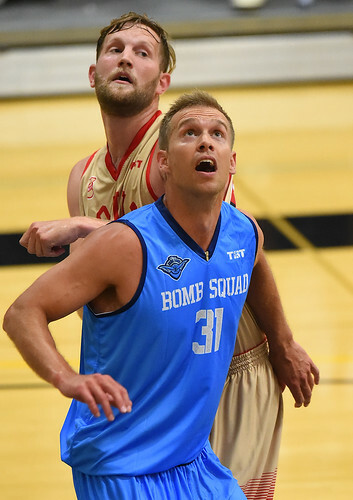 The team’s general manager, Matt Holland, and Bomb Squad teammate Mike Fitzgerald competed on the U.S. Armed Forces basketball team back in 2014 where they won the SHAPE International Basketball Championship. Michael Lyons, a newcomer to the Bomb Squad in TBT 2017, took a leave of absence from his job as a logistics coordinator last year to pursue his dream of playing pro basketball. He spent the 2016-2017 season with the Erie Bayhawks of the G-League and will look to bring that experience back to TBT for the second consecutive summer. Just like they all did at Air Force, the Bomb Squad will be utilizing the Princeton offense to try and carry them to $2 million. Will this be the year that they finally get over the hump? Lou Admunson tallied a game-high 27 points on 12-for-19 shooting as #3 The Stickmen opened the game on a 9-0 run and cruised to a 105-63 opening-round victory over the #14 Air Force Bomb Squad. Six of the seven players for The Stickmen scored in double figures, and the squad shot 62% from the field. Michael Lyons had 17 points in the losing effort for Air Force Bomb Squad, which trailed by 29 points at the half and has now lost its opening-round games in three of four TBT appearances. Former St. Mary's standout Paul Marigney heaved and sank a desperation 3-pointer with one second remaining to lift 7outz to a 80-78 victory over Air Force Bomb Squad. 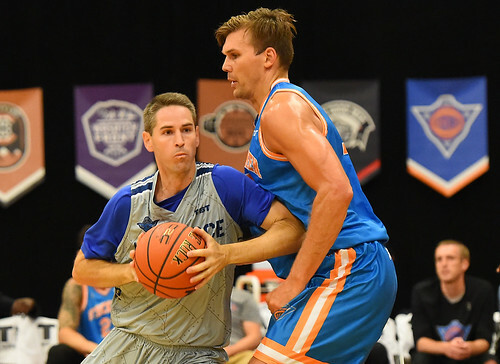 With 31 ticks left on the clock and trailing by two points, Air Force Bomb Squad's Matt Holland drained a triple from the top of the key to give his team a 78-77 edge. On the other end, 7outz missed a 3-pointer but corralled the offensive board and kicked it out to Marigney in the left corner. He escaped to the wing and hoisted the decisive shot, which ricocheted off nearly every conceivable part of the rim before dropping in. Marigney finished with 19 points, 12 rebounds, and five assists--all team-highs. Holland set the game-high mark with 23 points. Devin Brooks posted game highs in both points (34) and rebounds (12), and Team BBall Breakdown ran away from Air Force Bomb Squad in the second half to win, 105-90. Michael Lyons had 30 points, hitting seven of 10 three-pointers, in the losing effort for Air Force Bomb Squad. Michael Ojo (19 points) and Kentwan Smith (17 points) helped the cause offensively for Team BBall Breakdown, which will face Team 23 in a Round 3 matchup on Sunday, July 12th at 11:00 AM PT. Antoine Hood II led a balanced attack with 19 points as Air Force Bomb Squad cruised to a 116-66 victory over Too Fresh in an opening-round matchup. Todd Fletcher added five three-pointers for the Bomb Squad, which had five players in double-figures and led 50-23 at halftime. Emeka Ohaeri and Sean Lawrence each had 17 points in the losing effort for Too Fresh, which used only five players. 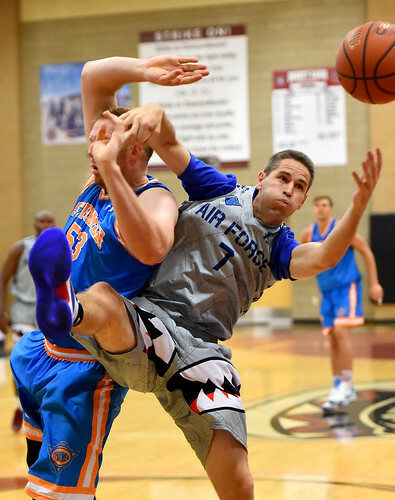 Air Force Bomb Squad moves on to Round 2 to face Team Bballbreakdown on Saturday, July 11th at 4:00 PM PST.